Introducing the new Goldpaw Martingale Collar! Featured in our most popular colors, patterns, and coordinating stripes. These vibrant collars are composed of 100% recycled polyester tubular webbing and feature a separate ID tag attachment. 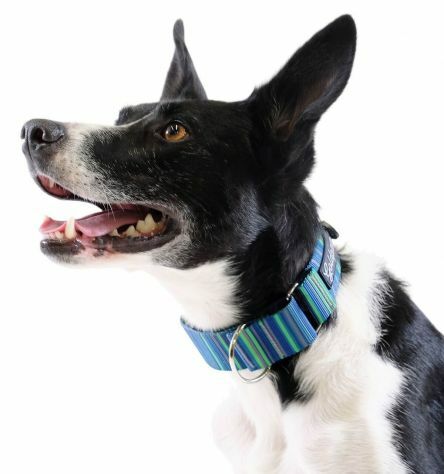 The martingale collar works great as your dog’s normal, everyday collar. Or, it can be used specifically for training. It just depends on what your needs are! The first loop looks like a traditional collar that is adjustable and hangs around the dog’s neck. The second is for control when the leash is attached. When the dog pulls, the collar tightens and will stay snug around your dog’s neck. When the tension is released, the collar loosens again. You have full control over your dog without putting pressure on the front of their neck. Recommended For: tough pullers, training aids, collapsing tracheas, dogs with large necks and smaller heads, preventing slipping out or backing out of the collar, controlling your dog safely as it's a much gentler substitute for prong or choke collars, great for puppies, adult, and senior dogs.